Marshall Minor Expert Reviews - Read Reviews and Buy Smarter Online. Verdict: Basically, the only problem Minors is that it is misleading in its use. We do not really know what to do at first. Or how to do ... It is also regrettable that the intra or hard plastic. Question comfort is average. Verdict: Marshall Headphones is licensed under the Swedish company Zound Industries which is also the same flag responsible for the Urbanears brand so you guys probably already know where I'm getting at. Verdict: The rock ‘n' roll sonic force inside Marshall's famous guitar amps doesn't come through these earbuds , but that's not the point. The draw of these buds is the cool gold knob on the outside, the bit that broadcasts your musician's savvy. Verdict: These earphones deliver a really nice sound. Very uncomfortable after long periods of time. Verdict: These headphones are of very nice quality and design. They sound great. Nothing negative to say about those. The only negative is the fact that they are very constricting. After a while, your ears will start to kill. Thats the only downside to these headphones. Verdict: As you'd expect from a company name like Marshall these are quality earphones for the price. They come with adapters so they can clip i to your ear, rather than into your ear canal. Verdict: If you're a person who doesnt like in ear headphones but wants the deep bass and sound they provide, look no further. 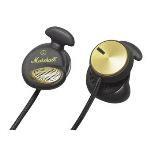 These earphones from Marshall are comfortable, and provide in-ear like sound quality! Great Buy! Verdict: "==Earphones - A music lovers necessity.== However if you're not one for these new fangeld 'inner ear' probes that well and truly _penetrate_ your ear canal, Like me, you'd struggle to find a decent pair combining comfort and sound quality. Verdict: If you are looking at Marshall for heavy unreal bass or treble, well move on. All Marshall's are more 'real' sounding, but have slightly flatter bass. This is an excellent earphone to choose if you are into more of instrumental music, especially guitars and rock. No longer can I listen to music without these beauties. Verdict: The Marshall Major FX headphones were something I first saw and tried in a local high street store. The price in the high street store was something that put me off, so I came to Amazon and found the same product for almost half the price. Result! Verdict: Sound is nice. Design is nice. If you're into the special in-ear design it has, go for it. But - apparently it has an issue with the minijack where it has a loose connection. After a month or two, the sound only works when the minijack is held in certain ways. After 2 replacements I gave up. Verdict: I needed good handsfree kit for mobile phone but I hate earbuds(my ears heat up) so these are great. With them hooked in they can't fall out or even pulled out. They sit just outside the ear so you can hear everything around you unless you turn up the volume :).